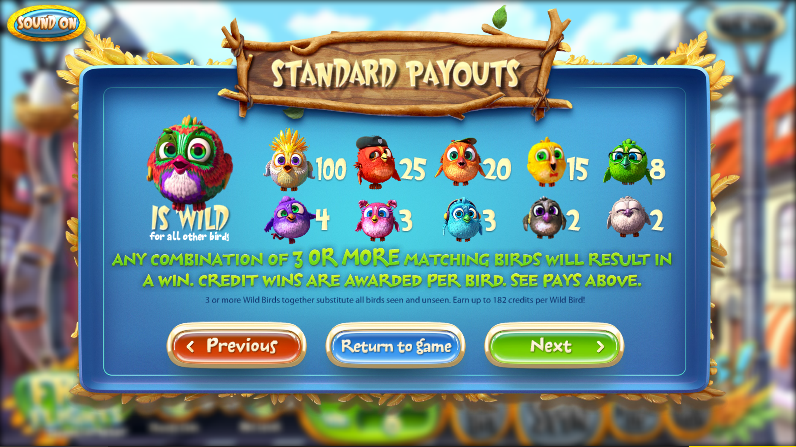 Some online slots exist in an area which blurs the boundaries between an actual slot and an arcade game and this release from Betsoft Games is one such example. It’s called Birds! and it includes some gaming mechanics and payline structures which are a little out of the ordinary – the good news is that it’s all explained in more details below. Birds! 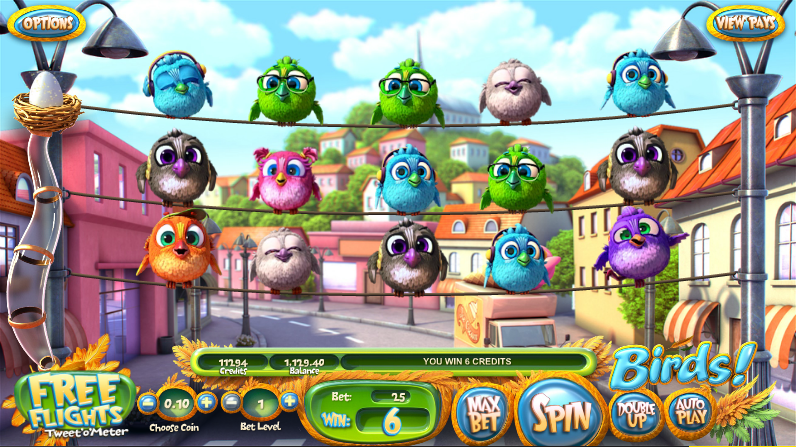 is a five reel slot with three rows but there are no traditional paylines; instead winning combos are formed by vertical, horizontal or grouped birds of matching types (not diagonal). The birds/symbols are on wires between two street lamps and the backdrop to this game is a sunny view of a small town with a church on a hill in the distance. There are ten basic symbols and these are all represented by birds of different colours; the wild symbol is a multicoloured bird which substituted for all others but there is no scatter symbol. More spins can be won during this round by filling up the meter again. Any win can be gambled by pressing the ‘Double Up’ button below the reels; this is a double or nothing Heads/Tails game which you can play if you want to risk your winnings. Birds! is a lovely game which reminds us somewhat of Thunderkick’s Birds On A Wire; the gameplay is enchanting and addictive and at it’s core, very simple, Check it out!